During the late eighties and early nineties, a select coterie of models dominated the modelling landscape with their individual beauty, illuminating presence, and mega-watt personalities. Amongst this grouping of Supers were a magnificent array of coloured models including Naomi Campbell, Karen Alexander, Kara Young, Gail O'Neill, Beverly Peele, Tyra Banks, and Veronica Webb. With the turn of the new millennium, individuality, personality and colour were relegated to the sidelines in a backlash by designers and casting directors against the supermodel excesses of the decade before. Fast-forward to the current Fall/Winter 2015 collections and colour appears to have come back in Vogue following a recent push by modelling agencies, designers, and casting directors to promote greater ethnic diversity and representation in fashion. American Vogue shines the spotlight this month on the industry's leading black modelling talent in an epic editorial lensed by the legendary Peter Lindbergh. 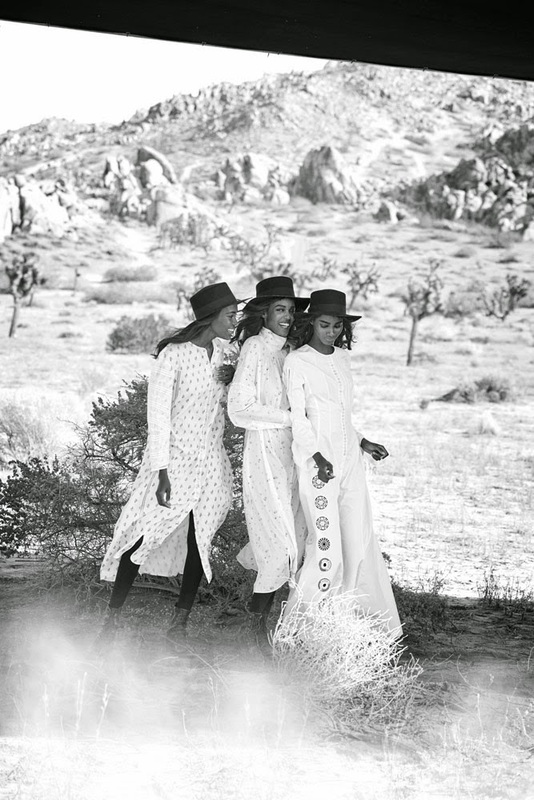 "Light Brigade" features rising stars Malaika Firth, Imaan Hammam, Leila Nda, Kai Newman, Tami Williams, and Aya Jones decked out in bowler hats, white cotton and lace ensembles paired with black leggings and ankle boots styled by fashion editor Grace Coddington. Collectively this spectacular group have the fashion world at their feet with Hammam, Firth, and Jones scoring recent campaign slots for Givenchy, Burberry Prorsum, Valentino, and Marc Jacobs Beauty. Williams, Newman, and Nda are joined at the hip while carving up Fall/Winter 2015 runways at Jason Wu, Edun, Rag & Bone, Diane Von Furstenberg, and BCBG Max Azria proving that strength indeed exists in numbers.